Today, we are going to post an in-depth review of the very popular Bluedio T6 turbine. These are the decent pair of wireless headphones that run on Bluetooth with a battery range of around 25 hours on a single charge. Right of the bat, one thing that completely amazed us is the size of the headphones. In spite of the fact that the size of the headband is entirely typical, the drivers are 57mm in a measure, which makes them one of the biggest drivers in the market. These are active noise canceling headphones that are very well built with a neat finish on top. The headphones run on the latest 4.2 technology and have a multi-functional button on the driver to control various functions. Comes with active noise cancellation technology. Runs on the latest Bluetooth 4.2 connectivity. 25 hours of insane battery range on a full charge. 57mm of extremely large drivers. Has an inbuilt microphone to take calls. Weighs at around 10 ounces. Talking about the design and build quality, the drivers of the T6 turbine are built of sturdy plastic, while the headband and hinges are made up of metal. The overall design of the headphones is pretty solid and will definitely last for a long period of time. Talking about the thing that we absolutely love, earcups. The earcups are 57mm in size and can be rotated fully flat for easier traveling. For some people, the size might be too much, but most of the users will surely love it. The large size of the drivers combined with active noise cancellation does great work when it comes to blocking external noises. The size of the driver also prevents any kind of sound leakage. The headphones are available in Yellow, Red, and Black colors. The most part of the body would be shiny black with the accents of the color. On top of the driver, you can a multi-functional button that can be used to turn on/off the headphones, and play/pause the music. Almost every other headphones come with multiple buttons for multiple functionalities, which sometimes creates confusion, resulting in pressing the wrong button. With Bluedio T6 turbine, that would not be an issue at all. The charging in Bluedio T6 is done via a USB-C port, which is very uncommon (charging cable comes in the package). The full charge takes around 1-2 hours, resulting in a battery range of 25 hours. One of the best features that the headphones have is Active noise cancellation. Trust us, after reviewing so many headphones, we think it’s hard to get noise cancellation at such a price point. The ANC might not be like something that you get in high-end headphones like Bose QC35, but looking at the price point, it’s amazing. 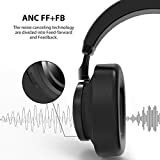 The sound quality is very clear and you won’t face any issue with that. However, the bass performance certainly depends on the status of the Auto noise cancellation. With ANC turned off, the bass would be really punchy, while with ANC turned on it would be less boomy. Overall Bluedio T6 offers enough detailed sound that would easily please a normal listener. For someone who is more of an audiophile, might not get that extremely detailed sound reproduction. But we must keep in mind that they are built for casual listening, not for studio monitoring purposes. Runs on the very latest 4.2 Bluetooth technology. 25 hours of excellent battery range. 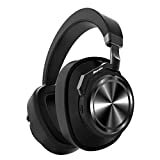 There are a lot of reasons why we would recommend these headphones to anyone, and the most important reason is the active noise cancellation, which is very hard to find at such a cheap price point.